GARLIC INJECTION COULD TACKLE TREE DISEASES | "Global Possibilities"
<">Injecting trees with a concentrated form of garlic might help save trees in the UK from deadly diseases. 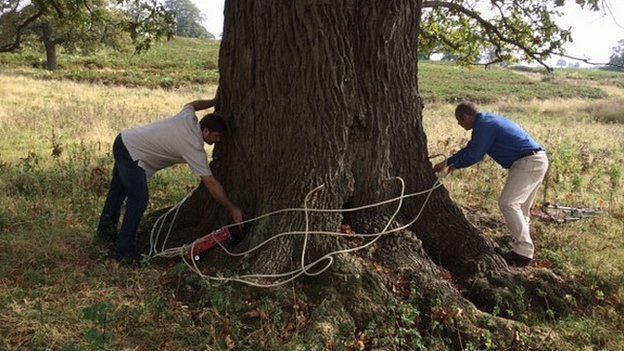 Oak trees with acute oak decline – which eventually kills the tree – have improved after being treated. In laboratory conditions allicin kills the pathogen chalara which is responsible for ash dieback. The solution is made by a company in Wales. “Organic cloves of garlic are crushed,” said Mr Cocking, “and a patented method is used to amplify the volume of allicin and improve the quality of it so it is stable for up to one year. Allicin in the natural world only lasts for about 5-10 minutes. Many conservationists also caution against such drastic intervention. Dr Anne Edwards from the John Innes Centre was one of the first to identify ash dieback in a coppice wood in Norfolk. She said that this treatment would not be effective for ash dieback: “In a woodland setting we really have to let nature take its course. It’s very depressing,” she explained.